So many times when we talk with people who have walked through the doors of Washington Catholic, the comment is made that they felt something that they couldn’t explain. That Washington Catholic is different, it is special. As many of our family members know, the Holy Spirit is alive here and is watching over us each and every day. We are blessed to have such an amazing place to teach our kids and to guide them in strengthening their faith and relationship with God. The reason we are able to do this each and every year is because of the generosity of our donors. Each year, the cost to educate our students is not fully covered by tuition. Therefore, we rely on the generosity of so many to provide the necessary funds we need to continue to offer the students, faculty, staff and Washington Catholic families opportunities in faith formation, academic excellence, service to others and personal development. In addition, we are also blessed by our increasing enrollment. Along with this comes the need for capital additions and improvements to our physical buildings. Once again, thanks to our donors! I am humbled and so blessed to be a part of such an amazing institution founded and supported on the shoulders of so many generous people. The impact that you are making as a donor will be felt by so many families for decades to come. Giving is a personal decision, one guided by prayer and the Holy Spirit. 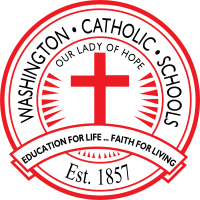 We thank you for entrusting Washington Catholic with the sacrifice of your generosity. May God continue to bless us as we live our mission.